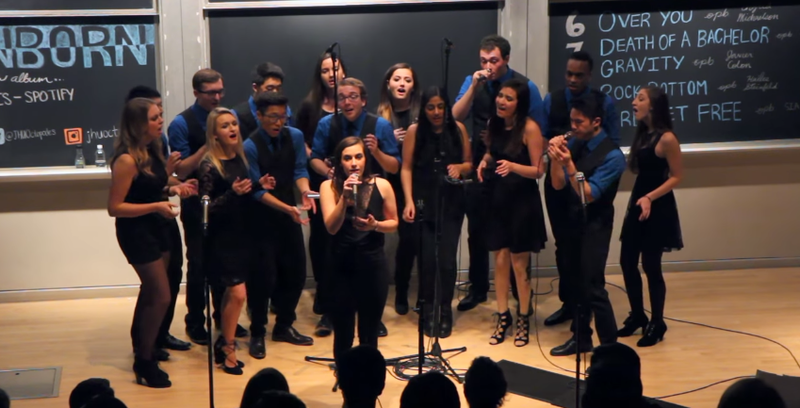 JHU Octopodes Blend All The Right Elements In Original Song "Crash And Burn"
Thank goodness for original songs in a cappella. They just make us feel, well, good. There's a certain elation that's felt when you stumble upon an a cappella video, only to see that the "originally performed by" section is populated with the same name of the performing group. What's an even better feeling is listening to an original song by a group and thinking they are natural pros at the songwriting process. That's at least how we feel about the Octopodes of John Hopkins University. Their song "Crash and Burn" feels radio-ready in every aspect. The song is laying down a major country, bluesy, pop groove rolled all into one as the Octopodes pack on intense and exciting backing vocals that keep the listener hooked on the arrangement. Not to mention that the drumming absolutely compliments the song style, keeping the energy of the song at a high level. And if that isn't convincing enough, soloist Isabel Evans knows how to hold an audiences attention. At times she's rocking some major crowd pleasing notes, and other times she knows how to dial it back and let the lyrics flow through her warm and captivating vocals. We just have one question. Where can we buy the single?